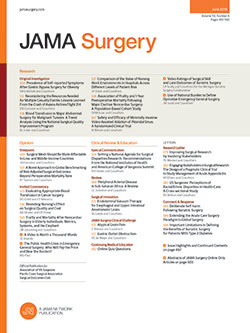 In the Original Investigation titled, “Airway Pressure Release Ventilation Prevents Ventilator-Induced Lung Injury in Normal Lungs,”1 published in the November 2013 issue of JAMA Surgery, important potential conflicts of interests were not reported by 5 of the authors.2 The following disclosures should have been reported: “Dr Habashi reports presenting at conferences sponsored by or in part by Dräger Medical between 2010 and 2015 for which he received remuneration for honoraria and travel. He is also a founder of Intensive Care On-line Network (ICON) and presented webinars hosted by ICON between 2010 and 2015 and continues to present such webinars and assist clinicians with questions, without any remuneration received. Dr Habashi also reports that he has been issued 2 patents for a ventilation method related to initiating, managing, and/or weaning airway pressure release ventilation and controlling a ventilator in accordance with this method. To date, the patents have not been licensed to any manufacturer and no monetary gain has resulted from the patents. Ms Andrews reports presenting at conferences sponsored by or in part by Dräger Medical between 2010 and 2015 for which she received remuneration for honoraria and travel. She also presented webinars hosted by ICON between 2010 and 2015, with no remuneration received. Ms Andrews also reports being employed by ICON since 2001. Mr Nieman reports presenting at conferences sponsored by or in part by Dräger Medical between 2010 and 2015 for which he received remuneration for honoraria and travel. He also presented webinars hosted by ICON between 2013 and 2015, with no remuneration received. Mr Nieman also reports holding multiple patents for methods to prevent, assess, or treat acute lung injury, sepsis-induced multiple organ dysfunction syndrome, or blood loss associated with cardiopulmonary bypass surgery. No other disclosures were reported.” The Conflict of Interest Disclosures section of this article was corrected online.